NOTE: After today’s post (and recent analyses), I believe it’s time to change the Blog subtitle. Hard to believe, but I think I’m now the most positive Eagles blogger I know of. Thank god for data and objectivity. Today let’s go back to the turnover issue. As most of you know, the Eagles were terrible last year when it came to “taking care of the ball”. The team had a turnover differential of -24, which is tied for LAST place over the previous 10 seasons. I repeat, LAST over the previous 10 seasons. (The Chiefs of last year were equally bad). 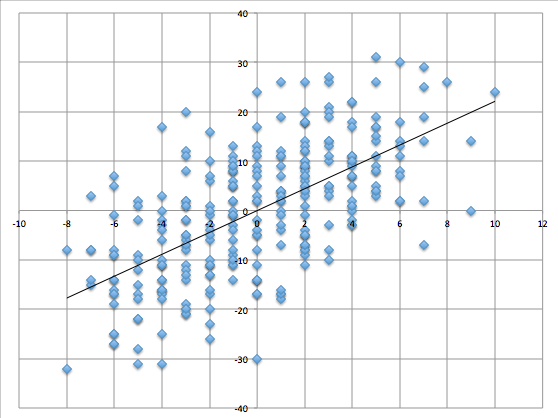 With that comes the previous analysis I did showing the correlation between TO Differential and Wins. The value is a very significant .64. So turnover differential is really important and the Eagles were historically bad last year by that measure, hence a 4 win season. Now let’s take it one step further and see if we can learn anything about what might happen THIS year. The correlation value is .63, about what we would expect given the first order Wins/TO Differential correlation value. The chart is a little tough to read, so let me make it simple with an example: Let’s say your team’s TO Differential FELL by 10 this coming season. To find the corresponding win change, find -10 along the Y axis and then move left or right until you hit the line. Here, a decline in TO differential of 10 equates to an approximate 4 win decline. HOWEVER, notice the spread is relatively large; this means we need to recognize that our level of precision (confidence) here isn’t very big. Well let’s go back to the 2012 Eagles. The team’s TO Differential was -24. As I’ve discussed before, this was heavily influenced by incredibly bad luck with fumbles (in both their existence and the team’s recovery rate.) I expect both measures to improve dramatically next season, purely because last year’s were so unlikely. Let’s say the Eagles move from the 99% in TO differential (negative perspective) to just the 90% (Using the last 320 team seasons/10 league years as data). That equates to a TO differential of -13. That’s still really bad (hence the 90%), so we’re not really doing the Eagles any favors here. However, because last year’s measure was so bad, moving to -13 is still an IMPROVEMENT of 11 turnovers. Here’s where it gets fun. Going back to our chart, an improvement of 11 in TO differential equates to an approximate gain of 5 wins. Presto chango, 4-12 last year just became 9-7 next year. Unfortunately, there’s that pesky little precision problem, which means a 5 win gain is far from certain. However, the overall point remains: by just being BAD instead of HORRIBLE when it comes to TOs, the Eagles can achieve a much better record. It must be noted though, that the Eagles achieving 4 wins last year with a -24 TO differential is a minor miracle in itself. The team’s “overperformance” last year means there’s probably a little less room for adding wins due purely to positive mean regression next year. Over the last 9 seasons (not including this past year since we don’t have subsequent season data), 17 teams registered a TO Differential of -15 or worse. The average change in TO differential the following season? a) The Eagles are likely to improve their TO performance substantially next year. b) Positive improvements in TO differential are STRONGLY correlated with positive Win changes. A + B = The Eagles have a significant chance (nothing is certain) to be A LOT better than you think next year. Great info. I have confidence the Eagles TO differential will improve simply because they’ll run the ball more and hopefully Bryce Brown figured out how to correctly hold a football during the offseason (he won’t play if he didn’t). I also think whether it’s Vick or Foles starting a QB, we won’t see as many INT’s as the last few years mainly because Chip’s passing plays at Oregon usually were quick reads for the QB and he didn’t rely as much as Reid on the vertical passing attack which can lead to more INT’s. This is just another reason why I’m so excited for the upcoming season. Great post (as always). Quick question; have you (or anyone else for that matter) ever looked at the correlation between turnovers in a game and points scored by the other team? The reason I ask is because I recall the Eagles having a TON of turnovers in the red zone, which can be viewed as a “best case” punt scenario. I would hypothesize that the Eagles change in points allowed per additional turnover would have been much lower than for other teams. Obviously this would take too much work to do–and you kind of address the point by saying that the Eagles outperformed for a -24 turnover team–but I would be curious to get your views on this hypothesis.